MSU BI experts guide clients through a milestone-based, stage-gated innovation process—starting with the technology transfer and process development, all the way through scale-up, purification and recovery. Through this proven derisking process, we move the technology directly from a bench scale fermenter to the pilot plant, saving clients valuable time and money. We work with a variety of organisms (bacteria, yeast, fungi, and algae)—in aerobic, anaerobic, micro-aerobic, and highly aerobic environments. Our team is well versed in commercialization and biobased industry experience. In the past six years alone, we have scaled up 27 different fermentation technologies from bench-scale to pilot-scale with a 100% success rate. While a process may perform well at bench scale, it doesn’t necessarily mean it can be brought to commercial scale. For instance, media that seem inexpensive at bench scale can become cost-prohibitive when brought to the next stage of development. Moreover, optimal equipment settings at bench scale are sometimes unmatched at a larger scale. 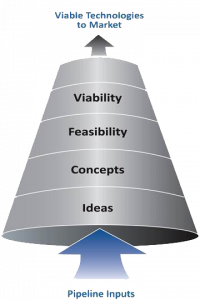 At MSU BI, our team utilizes this phase to provide early, clear insights into your technology, answering the most important question: Is your technology and its process economically feasible and scalable? 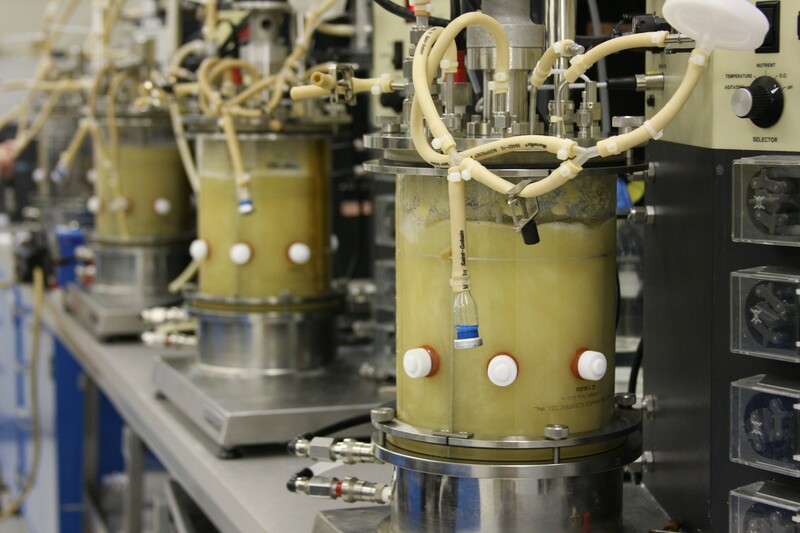 Bench-scale process development is performed with multiple Bioflo fermenters—22 overall—ranging from 2L – 10L in size. The fermenters are equipped with real-time monitoring and control of pH, temperature, gas flow, and agitation. In-line mass spectrometer off-gas analysis is also included for all bench-scale fermenters. The MSU BI team works with clients to accelerate their technology to commercial readiness. 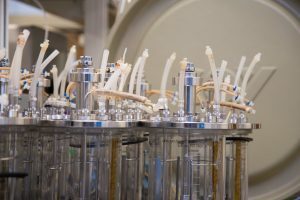 We have a solid track-record of improving bioprocesses and fermentations through many different means, including: optimizing process controls, process development, strain improvement, and media optimization. Further, as a Michigan State University unit, MSU BI has access to a variety of analytical equipment and expertise that is invaluable to scaling up client technology.